I hope you all had a fun and festive New Years Eve! Our weekend was very laid back and yet somehow I'm still tired! Guess that comes with the territory. 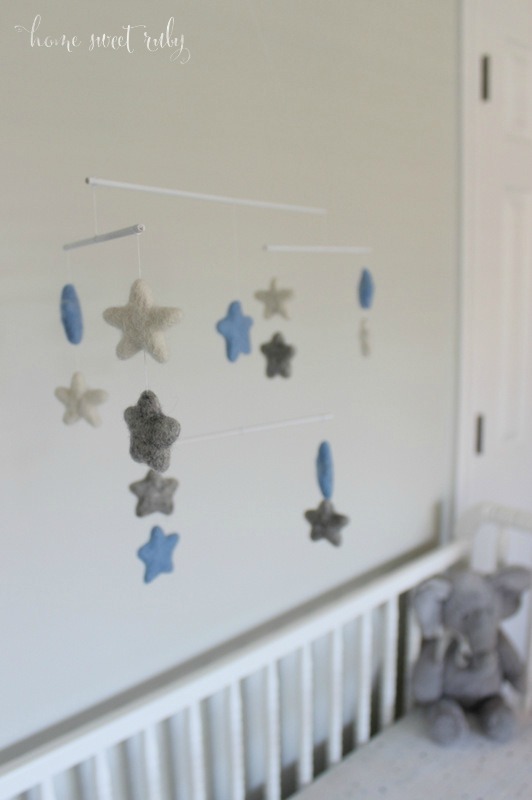 We did get a lot of work done on the nursery so today I wanted to share one of my favorite parts... the mobile! I have been so incredibly picky throughout this nursery planning process that I've basically forced myself into DIY projects, and this baby mobile is one of them. And though it has been a slight pain for this perfectionist to balance this thing, I'm so happy with the way it turned out! 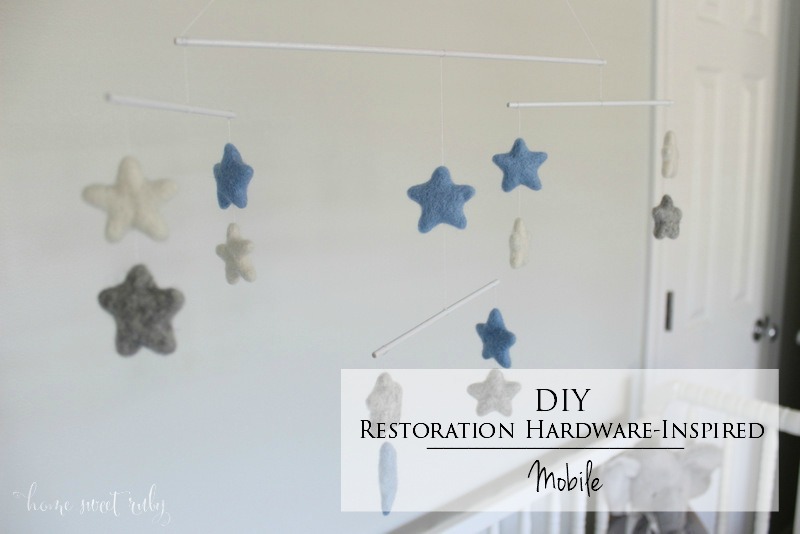 Initially I had my eye on Restoration Hardware's Wool Felt Night Sky Mobile, and though it was a reasonable price, tacking on shipping for something I felt like I could make myself put it over budget. 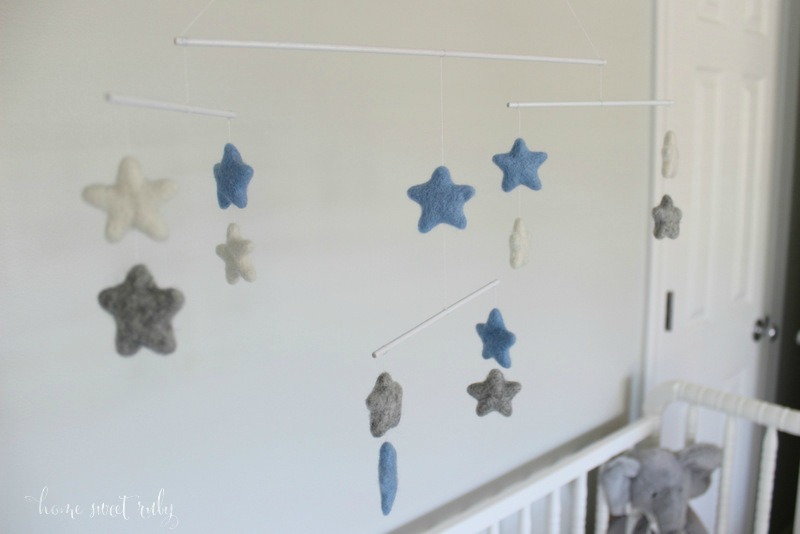 Then I remembered a friend of mine who made a wool felted bear mobile for her sweet little babe's nursery (see the amazing tutorial here, she is seriously SO talented!) 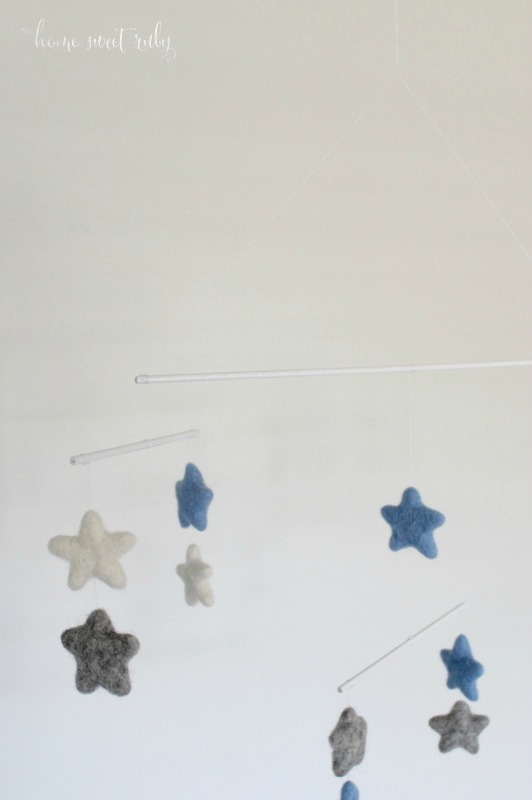 and it gave me the idea to go with the wool felted stars. 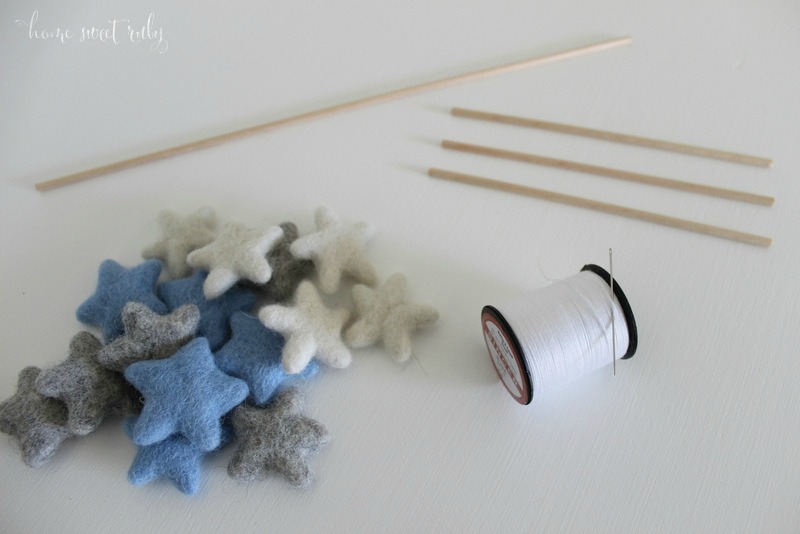 I ended up ordering the stars from the Etsy shop Handmade Only, which specifically sells felted wool shapes that are so cute and saved me a ton of work! I used a box cutter to cut the dowel rod into pieces. The longest is 12" and the other 3 pieces are 6" each. Spray paint the rods if you don't want the natural wood color. Once you've got your dowel rods cut, plan how you want the mobile to look. I added more stars after taking this photo. Using one long piece of thread (do not double it as if you were sewing), tie 2 or 3 knots on one end and tie the other end to your needle. The knot will keep your wool star from sliding off. Thread each star, or group of stars. The biggest pain with this project is getting the whole thing to balance. I had the stars threaded and ready to go for weeks but kept putting off the final process of putting this thing together. Tying your strings on the dowel rods (making sure they are roughly the same length) ended up being the easy part. Tie 3 or 4 knots to make sure the thread is secure. Once I was sure about the placement and length of the string, I trimmed the extra thread and put a tiny dot of hot glue on the knot to keep it secure. For the long dowel rod, just tie one piece of thread to each end so it will look like a triangle when hung. After everything is tied, hang the mobile up on a nail in the wall (or something else to get it off your flat surface) and start to balance it. The dowel rods will tilt if its not balanced, so its just a process of shifting the thread to the left or right, depending on which way the rod tilts. Take a very long piece of thread, loop it through the "triangle" you made with the thread and long dowel rod, and tie the end. Attach it to a ceiling hook where you want to hang the mobile and you're done! The mobile will move on its own (and your dog may bark at it from time to time), but since we used very thin thread, it will be very delicate and won't stick out like a sore thumb in the room. This may seem a little confusing but I swear its pretty darn easy, aside from the balancing part, so feel free to email me or comment if you have any questions! You're such an amazing DIY'er!! I'll be honest I'd just buy one because I don't have the patience but you did such an awesome job! I need to come over and see the nursery! This is so gorgeous! I love the little felt stars! They are so cute!!! Such a cute idea. I hope I become more of a crafter once we have kiddos. 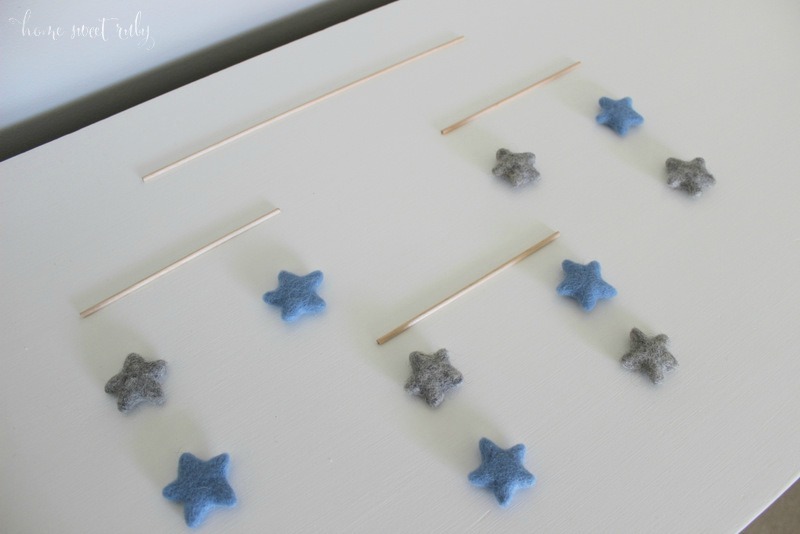 I so love the felted stars... so precious!!! Love it! It turned out fantastic. Go you! Love how it turned out and it's even more special since you made it. This turned out so cute! 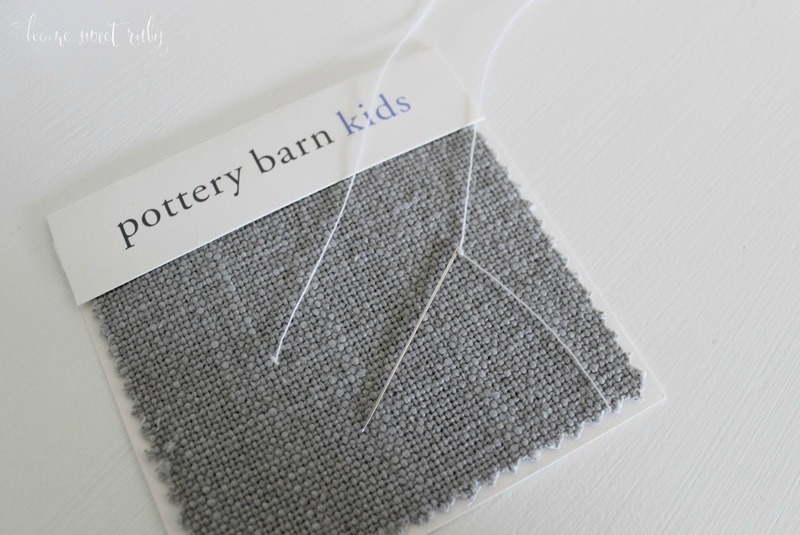 DIY elements in a nursery are some of my favorite parts! OMG this is so cute!!! You did an amazing job girl! Definitely going to have to keep that in mind when I have kids! This turned out great, and I love how it has some color to it vs the hardware restoration version. This lovely! It's so cute! Oh my goodness! It turned out so cute!